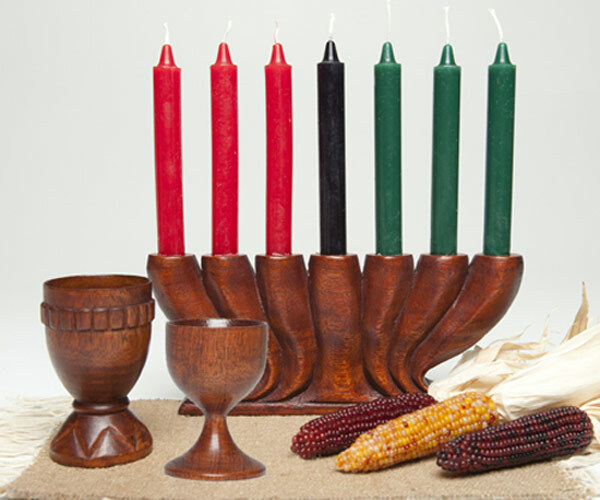 This Kwanzaa Candle Holder (Kinara) Approximately (16"h x 7"w), including: Seven Candles (Mshumaa Saba). Wood Unity Cup Shapes may vary, Carved or Tulip Shape (Kikombe Cha Umoja), brown corn and Place Mat (Mkeka) Sold separately. Perfect for Family and group Celebrations. (Now! Free Ground Shipping and Handling). The Candle holder (kinara) is the center of the Kwanzaa setting and represents the original stalk from which we came: our ancestry. The kinara can be shape - straight lines, semicircles, or spirals - as long as the seven candles are separate and distinct, like a candelabra.